Thank you for pointing this out. The main flaw in the driver licensing in the UK (and many other countries) is that you only have to pass the test once. Then your license is valid the rest of your life. Driving is a skill that needs to be taught and practised. The assumption that after one set of lessons and a single test that your driving standard will remain the same, and others would argue that it improves, is complete nonsense. Even the most conscientious of drivers will pick up deadly bad habits. I truly believe (after passing my driving test recently) that should should have to retake the driving test at a set interval. You can argue over this being 10 years, 5 years etc but the point remains the same you would easily take out of action in one fowl swoop those who lack the ability to drive properly. The alternative is what we have at the moment, they have to drive so badly that they get caught. Which usually means the death or serious disablement of an innocent person. Whilst re-tests would be a great idea I fear that there isn’t really any proper way of stopping someone who fails a re-test just getting into a car again. Just look at how many times you see reports of someone who has seriously injured or killed someone and the driver was either didn’t have a license or was banned? Unfortunately it’s not a skill that can just be “un-learnt” in the same way we can guarantee that every driver on our roads has a current license. Going by some driving I witness I do honestly think some people got their license with their cereal earlier that morning! As Gaz has said the whole attitude towards road use in this country shown by people stinks. Whilst only a few are on the truly dangerous end of the spectrum the vast majority that fall into the middle still don’t make me feel safe. They seem to think a “safe” pass on a cyclist is not hitting them and the roads are there as their own personal race tracks. All the while safe in the knowledge that if something does go wrong they’ll more then likely get away with a slap on the wrist even if they should kill someone. The car culture that has become ingrained in our society over the last 40 years and shaped our cities, towns and road networks needs to be reversed. Only then can we start to foster a culture like those countries in Europe. I agree with the sentiment of your comment, however I’d like to point out that possessing a licence is different to how or if a person drives a car. You are quite correct. There would have to be some pretty draconian policing and expensive technology to guarantee that all those driving a car had a license. I like many other people did not hold a driving license. At that time I never stepped into a vehicle to drive it, because I knew I was not licensed too. Now that I have a license I don’t drive because I’m not insured. Most people are law abiding (No anarchy in the UK, yet) and those same people would be awful drivers. If they had a mandatory retest they would have to accept the results. To drive without a licence is already a crime, which is a different from the idea that I present. Currently, you can only say that if someone has a licence that they convinced an impartial observer they were capable of operating a car once. Re-testing won’t change peoples behaviour after the test, that is a requirement for policing. This can also be said about the current system, but retesting will at least make sure their skills are up to date. A nice piece this! Brings up a lot of interesting points. Ideally cycle paths/routes should be away from the roads but that would cost a lot of money. I ride very defensively on my commute to work especially where left turns are concerned as people dont seem to like using their indicators. There are also a lot of buses on my route but I have to say they are very considerate of cyclists generally. I dont think that the Government is willing to look after us and spend the necessary time and money sorting out the problems on the roads. As long as they get their road tax, petrol tax etc they wont give a damn. I feel they think whats a few peoples lives when we would have to spend a large amount of money to have an impact unfortunately. I’m not sure that simply punishing people harder is sufficient. People speed not just because they don’t think they’ll be caught, but because – within their perception & understanding of the hazards – it feels safe to do so. Banning something that a lot of normal people feel like they ought to be able to get away with, something they feel is “OK”, isn’t going to work on its own – the issue of why they feel it’s OK to do, say, 40mph on a semi-main road needs to be understood & addressed. Which is, basically, that drivers feel it’s fine to drive as fast as they like as long as they don’t hit anything. They likely don’t have the consideration to realise that a close 40mph pass on a bike is a very unpleasant experience, and they certainly don’t have the big-picture _collective_ consideration to think about the cumulative impact of fast, high-volume traffic on a community or local environment. As far as any one individual is concerned – the council has put a road there, so it must be OK to drive on it whenever you please, and as fast as you can go without crashing in to something. I drive from time to time, when there’s no other sane option – and, in London, as little as possible, as I feel that needlessly operating a heavy motor vehicle in a space where there are people – and on streets which are the fabric of somebody’s community – is plain antisocial, on a par with dropping litter, playing loud music in your house at 1am, etc.. but while people lack the social sensitivity to appreciate that, or are so locked in to the “roads built for cars” mentality that they can’t imagine any alternative (indeed, can’t see the cost being imposed on them by others’ unnecessary motor journeys), it’s going to be tough to convince them that low speed limits are anything other than an annoyance & a way for the council to make money. There is something missing to change road user attitude – but I disagree that more policing will do anything. 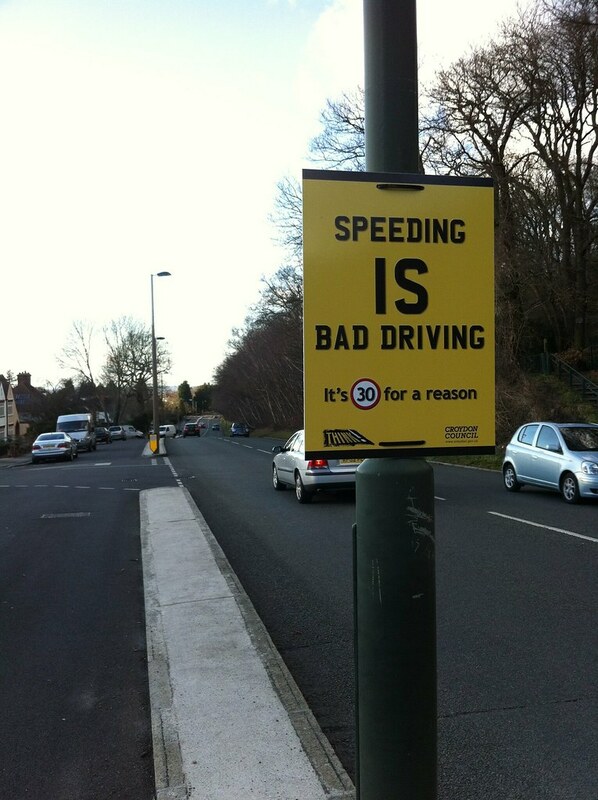 Speeding is a difficult offence to prove, which is why the police rarely pursue speeding cars. 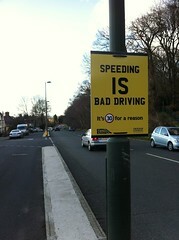 Speed cameras due a great job of controlling speeds over ten metre stretches of road. I find it very frustrating when driving (especially in London, which I do occasionally) that the car behind is usually a foot from my bumper, pushing me to go faster than the 30mph permitted. I actually think better education is a better idea. I think it would be great to see signs or adverts explaining why cyclists take primary position. I think that 99% of drivers don’t understand the door zone, or being visible, or stopping dangerous overtakes. I think car drivers get (unjustifiably) frustrated by the double standard of having to giving car sized space to cyclists, whereas cyclists need to give less space to cars. I also think car drivers get frustrated (justifiably) with cyclists who refuse to cycle with lights (the only mandatory thing that bicycles need to have in the dark), and pay little attention to the rule of the road, mainly traffic lights. If drivers can be educated to understand why cyclists ride the way they do, we can remove the frustrations that they have. I agree with the Times’ campaign, but not all their methods. I think that one thing that would make less people drive and more people cycle would be a change in the infrastructure to favour cyclists and pedestrians. 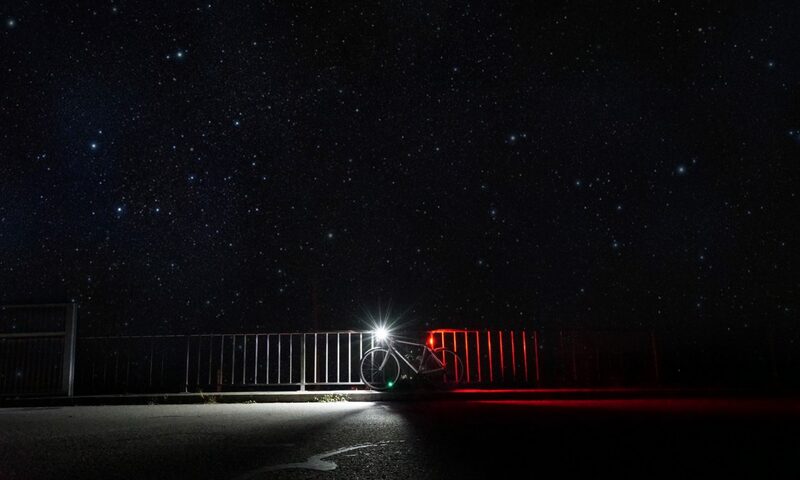 Make cycling easier, and more direct. Where I do the majority of my cycling, the cycle paths lead toward the local train station, and about a hundred metres from the station, inexplicably end, leaving cyclists to merge with busy traffic. Why would anyone cycle? Unless the cycle paths take you direct to the station, the simplest and safest thing to do is take a car. Infrastructure can make drivers and cyclists safer, and not necessarily through segregation. I have to totally disagree with you on this one, Gaz. When I started reading and campaigning over 5 years ago I was a staunchly vehicular cyclist and felt strongly that enforcement, shared space and ‘safety in numbers’ would be the key to a decent cycling future in the UK. My mind has been totally changed since then. One striking issue is the difference in ‘attitude’ of drivers here and in Holland. Underlying this is the simple fact that they are no different from us. What IS different is 2 factors, cycle use among drivers in Holland and their attitude to road design and planning. Cycle use will change over time (we all hope!). We already have one of the most stringent, well thought out training programs in the world for motor vehicle testing. More training, or retesting, can’t produce significant changes (and there’s no evidence it will). I will concur that enforcement is pathetically limited to fines that cost less than a tank of petrol – this MUST change but won’t alter driver behaviour unless it’s changed drastically (like income-linked speeding fines and the abolition of leniency in the points system etc). It’s the Dutch approach to road design and town planning that works over there. Their roads and junctions are designed to reduce conflict. Ours seem designed to encourage it. You read Hembrow’s blog – their drivers are people just like our drivers – it’s the road environment that matters most. I sincerely believe that focussing on ‘education’ (cyclists or drivers) is counter-productive to our cause. Please remember that the ‘Road Safety’ industry has been created and funded by the motoring lobby and is used by them to distract us from the real issues and from the methodologies that can make our roads safer and more pleasant but at the cost of motoring. Our residential streets have become rat-run car-parks. The only place where children play are cul-de-sacs. The only approach to allowing residential streets to be safe is with speed bumps that piss off residents and still don’t prevent through traffic. We have allowed arterial traffic through ALL our roads in order to facilitate increased vehicle use. Our kids no longer play in the street or cycle themselves to school. I have a picture on my desk cut from the Bournemouth Echo. it shows a class of junior school kids and their teachers in Hi-Vis vests. Given generously by Sainsburys and another company to ‘promote Safety in the Community’. Not even for cycling, but for walking to and from school. THAT is what our Road Safety industry promotes. Not safer roads, less traffic, better public transport, speed limiters for cars or anything that runs contrary to the motor lobby. And – I will even go so far as to say that YOU help this terrible attitude with your ‘silly cyclists’ blogging. Look across the channel, do they castigate people for cycling ‘badly’? No. You have had to become a vehicular cyclist to survive in London and so judge cycling by those standards. The law is there to protect us from the dangerous actions of OTHERS. No law against skiing, eating cake or suicide. It’s only in Road Safety we find laws to protect us from ‘ourselves’ (seat belts, proposed helmet laws etc) where in reality the danger lies elsewhere. Bournemouth Council has applied for a grant from the sustainable travel fund in order to ‘promote’ and ‘educate’ and spend virtually no money on infrastructure. Tunnel vision on ‘education’ will take us nowhere and can only delay the improvements we need. I don’t see a conflict between promoting vehicular-ish cycling (as a survival technique for today) and campaigning for better conditions (for tomorrow, and for everyone who doesn’t ride right now). 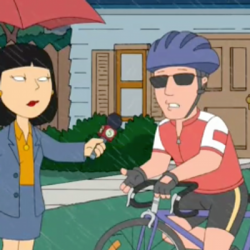 The sillycyclists videos are a valuable awareness-raiser for those riding & driving with today’s crappy conditions. It shouldn’t have to be like that, and we must fight for better, but there are plenty of us on the roads right now & many could learn something from Gaz’s videos. I disagree with your note about them being no different to us. Having cycled in Holland, Germany and Denmark I can safely say that not only the road design but the temperament of the drivers is different. They respect a cyclist (at least those I encountered). This might be due to bigger penalties by law enforcement? I don’t know how a driver at fault would be treated by the Law in Denmark or Holland but I have a feeling that the police and courts would be harder on a driver that knocks over a cyclist. It would take a change of seismic proportions to change public attitude in the UK. Starting also just with the attitude of drivers to other drivers, let alone how they treat the cyclists and motorbikes. I can’t see a nations super-tribal chariot-like aggression disappearing after a few extra lanes and safety features are provided for us cyclists. The majority of people just don’t have a demeanour that includes giving a hoot about others on the road. I agree that partly its an enforcement issue. I also agree that ‘a few extra lanes’ won’t solve it either. But we’re dealing with people. Who, underneath it all, are no different to you & I. If road design in Holland had proceeded like it has here, they would have exactly the same issues and attitudes on the roads. Not because ‘people’ are fundamentally ‘bad’ but because the environment they have been provided with allows this attitude to flourish. Attitudes to cycling here are very similar to racism – based on tolerated ignorance. It’s only by making it clear in road design that pedestrians and cyclists have priority on the roads that this can start to be dismantled. Just because it’s a task of seismic proportions doesn’t mean we shouldn’t tackle it.